Impulse buying is a bad habit that you really need to get under control. It’s impossible to stick to a budget, save money or achieve financial freedom if you continually make impulse purchases. These tips are sure to help you get this bad habit under control. Impulse buying is a bad habit that you need to get under control. It’s impossible to tick to a budget if you’re continually making impulse purchases. Not only that, impulse buying is a huge culprit for people that are getting into a pile of debt and credit car bills. I always say that planning is the key to financial stability. Obviously, impulse buying isn’t planned and not part of your budget. 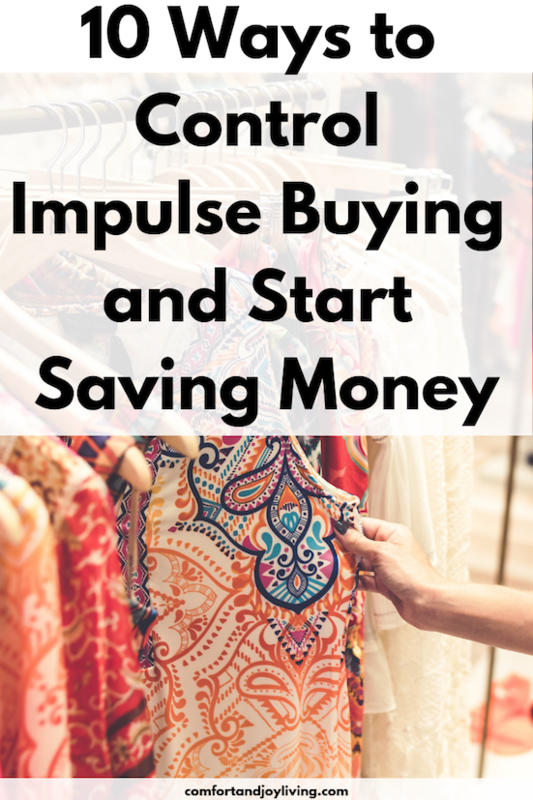 Here are some tips to help you if you’re an impulse buyer or shop to pass time. If you start to implement the following tips, you’ll see how much easier it is to stick to your budget and your overall financial plan. Whether you’re shopping for groceries, clothes or gift, have a list of what you really need to buy and stick to it. Using a list helps keep you focused so that you’re less likely to become distracted by anything that’s not on it. 2. Unsubscribe from retailers’ newsletters. You may have subscribed to your favorite stores to receive their newsletters that often have tempting sales and promotions. Do yourself a favor and unsubscribe from them to break this cycle. 3. Leave your cards at home. Try taking all your credit and debit cards out of your purse and keep them at home in a safe place. Just keep enough cash on you that your budget allows. It’s really difficult to impulse buy if you have no way to pay for the purchases, you have no choice but to just walk away. 4. Find other ways to unwind. Many people shop when they’re stressed out. Buying nice things does have a way of making us feel better. But the thing is, it doesn’t last and will probably make things more stressful when you blow your budget or get into even more debt because it. Try finding other ways to relax, there are plenty that won’t cost you anything. Go for a walk in a park, take a relaxing bath or read a book that will take your mind off whatever is stressing you out. 5. Put the cost into perspective. One trick that I like to use is to figure out how much time I will need to work to pay for impulse purchases. Divide the price of the item that you’re dying to purchase by your hourly salary. Let me tell you that you will most likely put back that designer purse when you figure out that you need to work two or three eight hour days to pay for it. 6. Wait to make a purchase. A good rule of thumb is to wait at least 24 hours to decide if buying something is a need or just a random impulse purchase by “sleeping on it”. This will allow enough time for your impulse to settle down a bit so that you can approach the purchase with a clear mind if you find that you really do need it. 7. Implement no spend time. It could be one day a week, one week a month or whatever you choose, just try it out. It definitely will help you stay on budget and keep you on the road to financial freedom. But in addition, it will help you realize that you don’t need to buy stuff to be happy, pass the time, or relieve stress. Impulse purchases are usually made with little or no thought about how it can affect you. Take some time before you hit the checkout and think about how the purchase will affect your budget, your financial health and your overall financial goals. You will more than likely put the impulse items back if you ask yourself this question. And after doing this for a while, it will become second nature to you and you won’t even have to think about it. 9. Remember the last purchase you regret. Before you pull out your credit card, recall the last time that you made a purchase decision that you regret. Decide that you won’t allow yourself to make another bad impulse purchase today that you’ll regret in the future. Whether your goals are financial or otherwise, keep them in mind before your make any impulse purchases. Perhaps you’re trying to build up your savings account, or you want to plan a trip across the country, but you can’t afford it. Think about your goals and remember that your small purchases add up to a lot of money, and can prevent you from meeting your goals. Create visible reminders around your home and office. Write your goals on sticky notes and place them on your refrigerator, bathroom mirror, or desk at work. Impulse buying is just a bad habit. And like any other bad habit, it can take some time to train yourself to stop it. But once you do, you and your bank account will be so much happier!